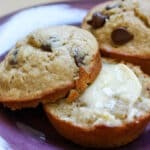 Tender and moist Peanut Butter Chocolate Chip Muffins are finally possible with just a scoop of sour cream and a couple bananas. 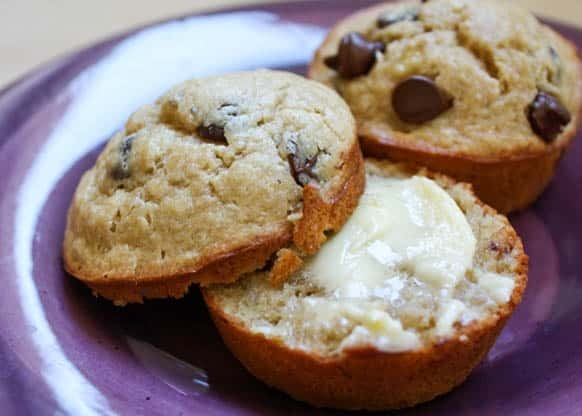 The bananas don’t add an overwhelming banana flavor, but the moisture they provide for these muffins is priceless. We love having muffins tucked into the freezer for mornings when there isn’t a lot of time for breakfast. They reheat beautifully in about 30 seconds. 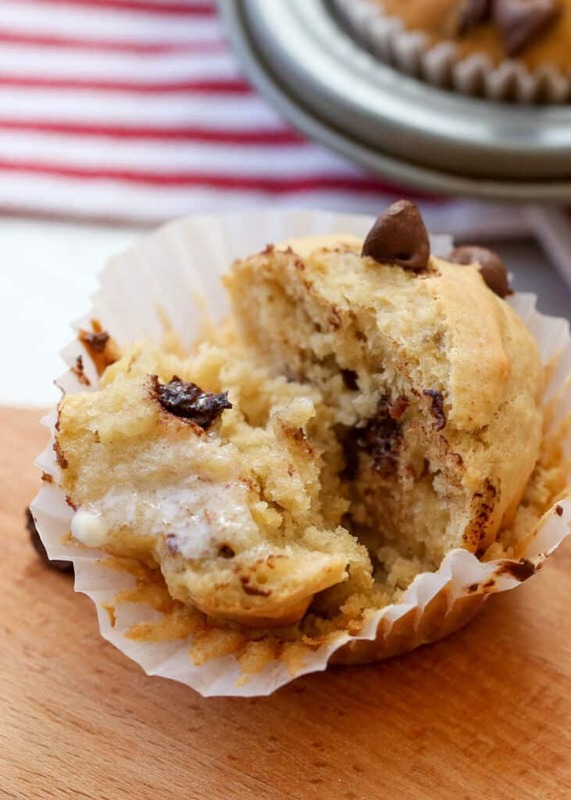 These Peanut Butter Chocolate Chip Muffins and the Hawaiian Muffins are kid favorites every time I make them. Kitchen Tip: I use this muffin tin, these liners (best deal ever! 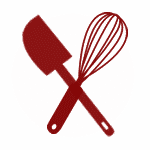 ), and this scoop to make this recipe. Preheat oven to 350°F. Mix together; bananas, eggs, sour cream, butter, sugar and peanut butter in a large mixing bowl. Add the flour, salt, baking powder, and baking soda. Stir until just combined; then add chocolate chips. Scoop into muffin tins. Bake for 20-25 minutes or until toothpick comes out clean from center. Enjoy! These muffins are also great with half whole wheat flour (I used freshly ground hard white wheat) and half all-purpose flour. Looks amazing! I wanted to make these in mini muffins tin for a snack to preschool class. Do they rise too much? I wanted to know if I should fill the mini cups all the way or just half way. I'd fill them about 3/4 of the way. They have a pretty good rise. Enjoy! Not at all. Feel free to substitute all purpose flour. Enjoy! Going to make these today with the ripe bananas that I didn't know what to do with. Thank You, Mary & Happy New Year !! !